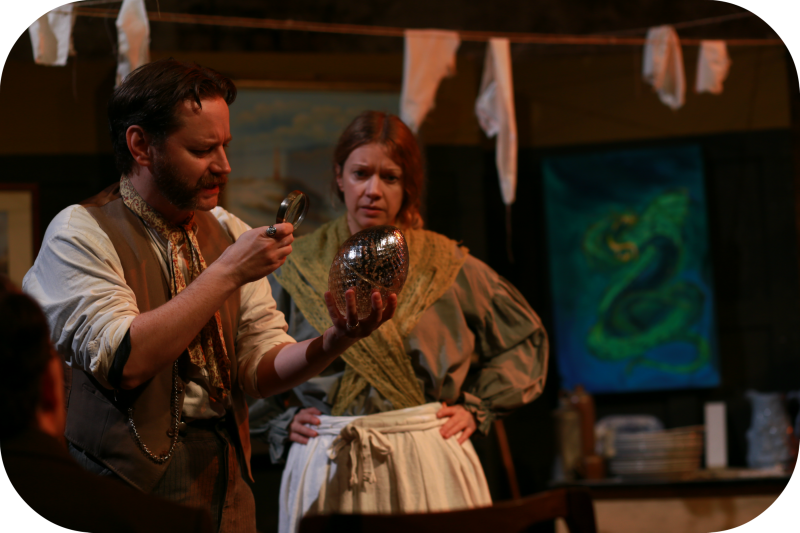 Mike Archer’s adaptation of a H.G Wells Sci-Fi classic ‘The Crystal Egg’, written in the same year as ‘The War of The Worlds’, has promise of out of this world encounters, characters faced with the unexpected and Victorian social comment. This highly anticipated production directed by Elif Knight boldly takes on the challenge of bringing the magic and mystique of The Crystal Egg to the live stage. Our story follows the Cave family in their home; the Cave’s antique emporium located in the Victorian London Seven Dials filled with wonderful and eccentric curiosities. The family is made up of Mr Cave (Mark Parsons) Mrs Cave (Jess Boyde) and their daughter Anna-Jacoby (Carolina Main). The family dynamic is turned upside down when their nephew, Charlie Wace (Des Carney), comes to live with them. Left orphaned after his father curiously drowned, Charlie inherits his fathers possessions – amongst which the beautiful Crystal Egg is found. An Egg that could change the impoverished circumstances of the Cave family forever, or crush them to nothing. The Vaults is a perfect venue for the Victorian Seven Dials to be housed. We journey underground and back in time to a dark, damp and very busy Seven Dials. We are greeted by the hustle and bustle of suspicious characters, wares sellers and fortune tellers as if arriving in the very hubbub of the thriving yet dangerous 19th Century London. The detail of the street and various shop fronts we are treated to are exceptional; a wonderful immersive design from Jason Kelvin. A brief of what this story will involve is given to the audience before being guided through the street and into the Cave’s shop. An exciting reveal as we enter a home full to the brim with curiosities; Kelvin’s set continues to impress. After the audience is seated, they are welcomed into the intimate life of the Cave family. 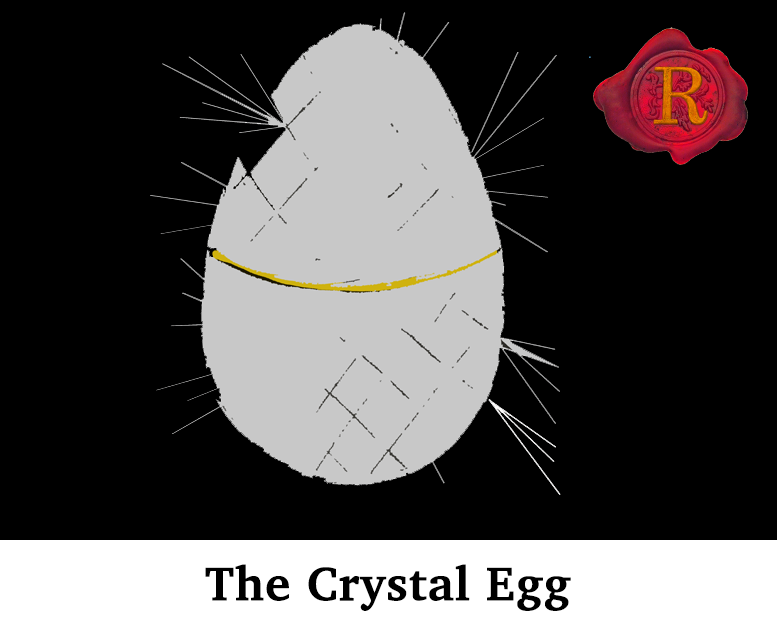 Unable to relax for long, it becomes clear the Crystal Egg is an intrusive presence to the once seemingly ‘good Christian house’ of the Cave’s. Mr Cave realises the Crystal Egg is not just the precious crystal ornament that it seems, as he is left alone with it that night, the Egg miraculously glows and he is greeted with visions of another world. The stage craft here is beautiful as the Egg, although simple, is incredibly effective as it glows from the inside and creates a luminous spectacle that fills the dark stage; richly atmospheric lighting from Simeon Miller. A personal highlight of mine is our view into the Martian world of the Egg that is created by projection and reflected onto the back wall of the Cave’s shop and intrudes into the simple landscape paintings on the wall; turning them into an unknown world that churns fire and steel. Effectively realised with Kime Chera’s video design, it makes us feel small and encompassed by a power greater than our own, from an unknown, hostile place. This is a moment where the production achieves its aim as a reflection on the intrusion of the future and technology that is so prevalent in our own lives. After this moment unfortunately the production fails to escalate. For me the reveal of the Egg’s powers comes perhaps too soon in Archer’s adaptation and the unfolding story becomes fairly predictable. The energy flatlines, although the family continue to be torn apart by the power of the Egg, I was left underwhelmed, feeling that the idea the world is at risk was never fully realised. The production was described as multi-media but besides the one use of projection and immersive start, it could have been any naturalistic family play. Disappointing as the exciting start had such promise for the prospect of a Victorian Sci-fi adventure. Despite the best efforts from the cast, the production rarely felt out of this world.